A jury found Dylann Roof guilty of the Charleston church massacre Thursday, rejecting the twisted 22-year-old’s repulsive racism. Roof was found guilty on all counts after just two hours of deliberations. Roof stood with his arms by his sides, staring straight ahead as the 33 guilty verdicts were read. He will face the death penalty. The suburban police officer who killed Philando Castile during a traffic stop has been charged with second-degree manslaughter on Wednesday after protestors demanded for his arrest after weeks of marches and protests. Jeronimo Yanez, the Officer involved who shot and killed Castile will appear in court on Friday, was also charged with two felony counts of dangerous discharge of a firearm. John J. Choi, the Ramsey County attorney said, "It is my conclusion that the use of deadly force by Officer Yanez was not justified and that sufficient facts exist to prove this to be true." Castile 32, was a school cafeteria worker who was stopped Falcon Height back on July 6 by Officer Yanez of the St. Anthony police on a busy stretch of road near the state fairgrounds. According to officials, Officer Yanez fatally shot Mr. Castile after spotting a gun, and a lawyer for Officer Yanez said that Mr. Castile did not comply with orders given by the officer. However, Castile's girlfriend streamed the aftermath of the shooting on Facebook Live which painted a different picture claiming that her boyfriend had a license to carry a weapon and that he had been trying to tell Officer Yanez about the gun. According to sources familiar with the case claim that Castile had been pulled over many times before without any issue, and those who knew him personally claim he was nothing but a "calm and peaceful man." After the release of the Facebook video the governor of Minnesota, Mark Dayton, stated that Mr. Castile’s race might have played a role in the shooting. Protestors spent days camped outside the Minnesota governor’s residence, and at one point blocked traffic and threw objects at officers on a nearby interstate. This isn't the first time Minnesota has received backlash in terms of the way race and policing are handled. Last year, a Minneapolis officer fatally shot Jamar Clark, another black man, in an incident that also set off protests. And this year, an officer in suburban Edina was criticized by activists for confronting a black pedestrian, and a St. Paul officer was suspended after a police dog bit a man and a colleague kicked him. A chapter of the Ku Klux Klan says it will hold a victory parade in North Carolina to celebrate Donald Trump’s win over Hillary Clinton this week. The historical sign marking where Emmett Till’s body was found in the Tallahatchie River in 1955 has been riddled with bullets. According to the New York Daily News, since the Emmett Till Memorial Commission put eight markers in place surrounding the Tallahatchie County it has been subjected to vandalism over the years. The 14-year-old from the south side of Chicago was visiting family when he was abducted and killed for allegedly whistling at a white woman. The murder was rocked by protests and helped the civil rights movement. According to the reports, many of the bullet holes found near the river site are not new. A photo posted shows that the sign had been shot quite a few times from different angles at that time. “It shows that there’s still people who do not want to remember or talk about Emmett Till,” Patrick Weems, project coordinator for the Emmett Till Memorial Commission, told the Daily News. Weems told the Daily News that the organization, which is financially struggling, cannot afford to replace the vandalized sign at the moment and that it has instead launched a virtual tour of the sites in the form of the Emmett Till Memory Project The project, which is a site and smartphone app, virtually guides users to 51 different sites in and around the Mississippi Delta that are linked to the teen’s murder and trial. According to the Daily News, the Emmett Till Interpretive Center is currently trying to raise money to fund the project and replace the vandalized sign; so far it’s raised $4,00 0f the original 15,000 goal. “My brother was mentally ill” says sister after Police shoot unarmed man dead. Video released by an eyewitness captured a woman weeping as the body of brother lay in his own pool of blood after El Cajon California police fatally shot him. Officers were responding to a call of an African American male who appeared to be in his 30’s, was reportedly acting erratic, wandering around talking to himself and walking in and out of traffic. “I called the Police three times to help him, he was sick,” the woman said. Although his name was not officially released as police continue their investigation, his along sister along with relatives said the mans name was Alfred Olango who was 30 years old. Police chief Jeff Davis said in a statement that he wants the protests to remain and calm and to let police investigate, “ to shed light on this event” to be open and transparent as it pertains to the law, Davis said. It is not clear as to why the mans sister called the police, but when police arrived on scene he was behind a restaurant pacing back and forth as he ignored police demands to speak with them. He allegedly reached into his pocket and drew his “hands” in a shooting position that resembled a stance toward one of the officers. Davis said the man places his hands in the officers face at which the first officer responded by tasing the man while the second officer fired the fatal shot that killed the man. The incident comes on the heels of hundreds of Police Shootings targeting African American men and women who are unarmed such as the case of Terrence Crutcher whose death sparked a wave of protest. While the details remain under investigation, several people including a man who was leaving the shopping center saw the man without a shirt wandering around and acting strange. He claimed that he heard about five shots by police officers. A official released on Twitter disputed some accounts of what happened, but the man was given standard CPR and was taken to a local hospital were he was pronounced dead. After a series of Police related incidents including Police involved shootings in Chicago and around the Country, the city is looking to ensure that every police officer on duty will be equipped with a body camera by 2018. Chicago Police Superintendent Eddie Johnson said in a statement released Saturday that " Body-worn cameras provide a rare glimpse into the dangerous situations Chicago Police Officers face every day in an effort to keep our communities safe. After the shooting death of Paul O'neil in August in which police were responding to reports of a stolen car. Body cameras were worn capturing the events leading up to the shooting, however, Johnson asserts that the use of body cameras will aid in better training and community efforts in all areas of the city. The department originally launched the pilot program as a test in some of the cities most crime ridden neighborhoods in 2015 that later expand to four more districts. "This expansion is a win-win for the public and for officers,"Johnson said. The department has gone through several changes over the years and by 2018 investments in technology will made to accommodate monitoring police activity. Tax payers won't have to foot the bill because the cost is said to be about $8 million dollars coming from the CPD's operating budget and from grants. Milwaukee Police Assistant Chief Bill Jessup told the Milwaukee Journal-Sentinel newspaper it wasn't clear if the gun was pointed at the officer. "Those additional facts will come out in the coming days," Jessup said. At a press conference late Saturday night, mayor Tom Barrett elaborated on the foot chase, saying that the officer involved in the shooting was chasing the suspect when he was ordered to drop his weapon. When the suspect did not comply with orders, the officer fired several times hitting the suspect with 2 bullets in the chest and in the arm. Mayor Barrett said the officer was wearing a body camera which was operating at the time of the shooting. Angry crowds to the street and set four businesses and several police cars on fire, hurled bricks through police car windows, threw rocks at police and vandalized bus shelters and street lights. Some social media users posted videos of what was said to be an undercover cop car being trashed by angry protestors. An officer was hospitalized after being struck in the head by a brick that came crashing through his squad car's window. "If you love your son, if you love your daughter text them, call them, pull them by the ears and get them home. Get them home right now before more damage is done," the mayor said. The mayor said police presence will be strong as part of an "all-out-effort" to restore order. At least three people have been arrested, he said. Mayor Barrett says he plans to spend Saturday meeting with church and community leaders, adding that the police presence will continue to be very strong. Chicago Police Department released videos Friday showing the July 28 officer-involved shooting incident of 18-year-old Paul O'Neal. Officers are heard cursing at O'Neal, whose arms appear limp as they put him in handcuffs. The fatal shooting is not captured in the videos, but the shots can be heard. 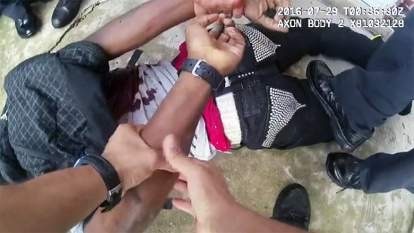 The footage "as shocking and disturbing as it is, is not the only evidence to be gathered and analyzed when conducting a fair and thorough assessment of the conduct of police officers in performing their duties," said Fairley, chief administrator of Chicago's Independent Police Review Authority. The video clearly shows officers firing down the street at the car as it speeds away. The city’s use of force policy explicitly bars police from shooting into a car when the vehicle represents the only danger. Under Fairley, who was appointed in the wake of the McDonald video's release, IPRA has ruled more police shootings unjustified in the past two months than it had in the prior nine years. Two of the shootings IPRA recently ruled unjustified involved officers shooting at vehicles, as they appear to have done in O'Neal's case. In both of the shootings ruled unjustified, IPRA determined the officers faced no serious danger when they fired. Police handcuffing a bleeding O’Neal after he was shot. The department revised its deadly force rules in February 2015 to ban firing into a vehicle when the automobile is the only force used against an officer or bystander. Prosecutors dropped the remaining charges Wednesday against three Baltimore police officers awaiting trial in the death of Freddie Gray, bringing an end to the case without a conviction. Gray was a black man whose neck was broken while he was handcuffed and shackled but left unrestrained in the back of a police van in April 2015. His death added fuel to the growing Black Lives Matter movement and caused massive riots in Baltimore. The decision by prosecutors comes after a judge had already acquitted three of the six officers charged in the case, including the van driver and another officer who was the highest-ranking of the group. A fourth officer had his case heard by a jury, who deadlocked and the judge declared a mistrial. 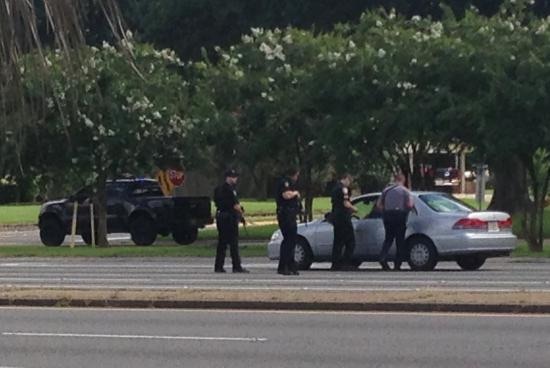 Authorities in Louisiana say three law enforcement officers were fatally shot Sunday morning, and three injured in Baton Rouge. One suspect is dead and a manhunt is now underway for two other possible suspects. A witness told WBRZ News that they saw a man, dressed in black and with his face covered, shooting near a car wash around 9 a.m. Attempts to reach police for comment were not immediately successful. The shooting follows a similar tragedy in Dallas less than two weeks ago. On July 7, lone gunman Micah Xavier Johnson, a 25-year-old Army veteran, shot and killed five police officers and injured seven others as a Black Lives Matter protest was winding down. He had no association with the group. Two Americans from Lakeway, Texas, were killed in Nice, France, when a truck struck a crowd celebrating Bastille Day there. Sean Copeland, 51, and his son Brodie Copeland, 11, are among the at least 84 people killed in the apparent terrorist attack. "We are heartbroken and in shock over the loss of Brodie Copeland, an amazing son and brother who lit up our lives, and Sean Copeland, a wonderful husband and father," the family said in a statement, the Statesman reported. "They are so loved." The Copelands were on a family vacation that had taken them from Pamplona to Barcelona in Spain and then to the French Riviera city of Nice, Jess Davis, a family friend and representative, told the Statesman. On Twitter, family member Heather Copeland wrote of her heartbreak at the tragedy. "I don't even know how to put this in words," she wrote. "Today was a very tradgic [sic] day for my family." Another family member, Haley Copeland, wrote in a Facebook post that the Copeland family was on vacation in Europe celebrating a birthday. "This is an extremely difficult time for my family and anyone who knows Sean and Brodie Copeland," she wrote. "Losing a loved one is hard no matter the circumstances but losing a loved one in such a tragic and unexpected way is unbearable. Prayers are much appreciated." Brodie Copeland was a baseball player, and the Hill Country Baseball Club posted a photo of him on Facebook. The photo was sent to the club earlier on Thursday, according to the Facebook post. "Nobody deserves this type of fate, especially not such a wonderful family," the post reads in part. "You are in our hearts, thoughts, and prayers. Rest in peace, Brodie and Sean, you will be remembered by many." The Pastime Training Center, where Brodie played baseball, also posted a photo of him. "Two of the greatest men. We will miss you #8. You will be missed but we know you were needed for bigger and better things," wrote Bill Bishop in a comment on the Facebook post. A man who was arrested Saturday following a Black Lives Matter protest at Taste of Chicago has been released after posting bond. Ja’Mal Green, 20, was charged with two felony counts each of aggravated battery to a peace officer, and aggravated battery in a public place, according to the Cook County state’s attorney’s office. He also faces one felony count of attempting to disarm a peace officer, and two misdemeanor counts of resisting arrest. On Monday, Judge Peggy Chiampas ordered Green held on a $350,000 bond and his next court appearance is scheduled for Thursday. Green has since posted bond, according to court records. A video posted Tuesday night to Facebook showed him being released from the Cook County Jail, with dozens of supporters cheering and hugging him. Green was one of 19 people arrested in Saturday’s protests at Taste and around the Loop following police shootings of black men in Baton Rouge, Louisiana; and near St. Paul, Minnesota; and the deadly attack on police in Dallas. The group, including Black Lives Matters activists, began with about 50 people outside the Taste at Michigan and Van Buren, the Chicago Sun-Times reports. They were met by a dozen police officers who wouldn’t let them into the free festival with the oversized signs they carried, calling for “Justice for Alton and Philando” — Alton Sterling and Philando Castile, who were killed by police officers in in caught-on-video shootings that have rocked the nation in recent days. Four protesters were arrested in the Near North police district, and 15 arrests happened in the Central District, police said. At least two others were arrested in downtown protests on Sunday, and the demonstrations continued Monday afternoon. The new Bronzeville Arts and Recreation Center that opens Saturday will not only provide the community with resources it never had, but also catalyze the “renaissance of Bronzeville,” Mayor Rahm Emanuel said Friday. The Arts and Recreation Center in Ellis Park, at 35th Street and Cottage Grove Avenue, has been more than a decade in the making. But it wasn’t until 2014 that design and funding plans were developed and 2015 that construction began. The $19 million Chicago Park District facility has a pool, gym and fitness center. There’s also arts and community spaces, offices and a rooftop terrace. Once known as the Black Metropolis or Chicago’s Black Belt for being the center of the city’s African-American culture, Bronzeville has suffered economically in recent decades, like many other South Side communities. CTA began its $240 million renovation on the Red Line's 95th Street/Dan Ryan Station on Chicago's South Side. "You know this is a tremendous success when there are this many people on this side of the microphone versus the other side of the microphone," Chicago Mayor Rahm Emanuel said. Emanuel said the project will create more than 700 construction jobs. The new station will better accommodate the large crowds, according to CTA about 20,000 passengers uses this terminal in cycles, via Bus and trains. The remodel version will look more like an airport terminal than a CTA train stop. "And I think it will have a sense of openness and safety that the current terminal struggles to achieve on a daily basis," CTA Chief Infrastructure Officer Chris Bushell said. Modernizing 95th Street Station is a prelude to extending the Red Line train south to 130th. That plan involves running trains in the median of I-57 for a bit, then they'd turn south and run alongside existing Union Pacific track to 130th. That project would cost billions and displace more than 100 homes, but would also add four new station stops to an area traditionally reliant on buses for mass transit. "There's a great demand for fast, efficient rail services. We want that for every resident of the city," Claypool said. ​Someone please call 911… or should we? How does a series of kicks and punches land the victim behind bars? This is a question many are asking about 24-year old Shaquille O’Neal, who was video recorded being brutality beaten by two Chicago police officers. After the video went viral on Facebook, the suspect is facing charges under accounts of “assaulting an officer, violating parole, possession of drugs, and disorderly conduct” according WGNTV. According to Fox 32 Chicago, police say that they saw O’Neal engaging in a drug deal with three bags of heroine on him, and they were attempting to stop him in the act. Police also say that O’Neal fled, at which point they decided to use force against him. He bit one of the officers on the hand, and they began to stomp on him. O’Neal’s representative and attorney, Michael Oppenheimer , states, “People run from police for all sorts of reasons. One of the problems is you have lots of young African American men who are quite simply afraid of the police and they're afraid of what police will do to them, and so they run,” Oppenheimer said. O’Neal was beaten until he went “limp” and unconscious. 24 hours later, O’Neal was charged in an attempt to justify the police’s actions towards their suspect, and the police was initially put on desk duty. He was just recently dismissed from his law enforcement duties. While no one can necessarily justifying O’Neal’s actions or the police officer’s actions because of a lot of hearsay, but nonetheless the extent to which the police beat this man was unnecessary. Unfortunately, this type of thing is not unheard of between the Police Department and the citizens of Chicago. One of the most popular cases was the McDonald Case. LaQuan McDonald was shot 16 times by police officer Jason Van Dyke in the crisp fall of 2014. Not only was this member of the law enforcement initially not held accountable for his actions, Mayor Rahm Emanuel’s emails were leaked that revealed an attempt to coverup the video to ensure that it wouldn’t be released to the public in exchange for a 5 million dollar settlement. Another case was the case of a the 17-year old Cedrick Chatman who was killed in the middle of the day of 2013 . Similarly to the McDonald case, according to CNN, city officials attempted to withhold the video and did so for almost three years. The Independent Police Review Authority acknowledges that from 2009-2016, police officials have killed 106 people and wounded 237 people. These numbers are outrageous considering according to the same source, 89.1% of the causes of death is gunshot. From this, we know that something needs to change. Mayor Rahm Emanuel pledged to utilize a quarter of a million dollars last year from the Chicago Police Department Policing Program to finance gun buyback programs, says ABC new in October 2015. More recently, Rahm Emanuel made more of a effort to make our streets safer by increasing the number of law enforcements on the street during the Labor Day weekend. New York Times quoted Emanuel:“If we all come together and reclaim our streets, reclaim our parks, there’s no room for the gangbangers,” on the same weekend. In December 2015, Emanuel finally commented after the resolution of the McDonald case and the continuous rejection from the black community, Emanuel said during his apology stating he wanted “nothing less than complete and total reform to the system and the culture that it breeds”. While he makes promises and has made progress, the McDonald case and his involvement in it almost cost his the mayoral race last year. This goes to show while, yes, progress is being made, there isn't enough plan being done to make our neighborhoods safer and for the people of it to feel safe. A New York Times survey conducted May 2016 confirmed that 70% of the poll disapproved of Emanuel and his progress. All in all, Chicagoans are afraid to let their children play outside for fear of the police. Chicagoans fear going outside at night for fear of being shot or even the possibility of interacting with law enforcement. Even worse, black Chicagoans have lost faith in Mayor Emanuel’s ability to improve our progressively worsening crime rate and overall environment. So, if Chicagoans, live in fear and fear to trust, I leave you with the the final thought to decide: If the people cant trust the police to protect them, who can they trust? The biggest hamburger chain is moving back to the beautiful city of Chicago. This time, it plans to take over what used to be one of Chicago’s main attractions: Harpo Studios. Mcdonald’s, which was previously based in Chicago from 1955 to 1971, signed a lease to trade the suburbs for the downtown city life, again. The move will take place in 2018. Harpo Studios, which housed the Oprah Winfrey Show until 2011, sold the site to developers for more than $30 million, in 2014, as reported by Fox 32. Mcdonald’s Corp. CEO Steve Easterbrook hopes that this move will entice talented, young people who are more interested in living in urban areas. “great talent is excited about where they work” (Fox 32). Urban life, becoming more favorable than city life, started with the parent of United Airlines relocating to downtown Chicago, from Elk Grove, IL, in 2010, said Steve Stratton, international director of JLL, a commercial real estate services company. According to Fox 32, this will place McDonald's into Chicago's West Loop neighborhood. On May 21, 2016, New Life Covenant Church Southeast and a host of community and faith-based organizations are teaming up for the sixth annual “Prayer on the 9” community initiative. They are forming a two-mile prayer line along 79th Street from Greenwood to the Dan Ryan, on both sides of the street, to demonstrate a unified stance against violence and to pray for the communities most affected by it. Participants are asked to wear the color red to symbolize the blood that has been shed in our neighborhoods and to bring a photo of a loved one lost to violence. And together, in a moment of silence, everyone will step into the street with there photos raised and lie down on the pavement to illustrate the bodies and lives we’ve lost in Chicago. Illinois Secretary of State Jesse White's office said Tuesday that beginning in July 2016, applicants will no longer be issued a license or identification card. Instead they will receive a temporary paper driver's license or ID that's good for 45 days. They'll also receive their old ID with a hole punch. Those will serve as identification and are good for air travel. The office then will send the applicant's information to a secure facility in Illinois for a fraud check. The state will then send the applicant via mail a more secure license or ID within 15 days. These changes will help the state comply with federal Official ID standards.